Nathan Myrick was a pioneer settler and Indian trader. He journeyed to Wisconsin in 1841 to try to work for H. L. Dousman and other traders at Prairie du Chien. They would not employ him because he had no knowledge of the Indian languages. But Myrick found a partner in November of 1841, borrowed an army keelboat and a stock of trader's goods and poled up the Mississippi River to Prairie la Crosse — now La Crosse. There they built the first cabin in La Crosse and became successful traders with Indians. In 1842, Harmon J. B. Miller replaced Myrick's original partner. A few years later, Myrick acquired a sawmill on the Black River, and sold firewood and lumber to river steamers on the Mississippi and rafted timber to St. Louis. In 1848, at the government land sale in Mineral Point, Myrick acquired title to a claim at La Crosse. But the same year, profits declined due to flood damage to the sawmill and the removal of many Indians from the area. In 1848, Myrick established another trading post at Sauk Rapids, Minnesota. He resided in Minnesota, and eventually built a chain of about 15 trading posts throughout the state. 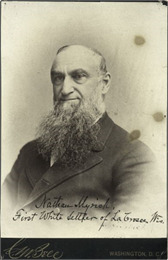 He retired in 1876, and made his home in St. Paul until his death. Although he left Wisconsin in 1848, Myrick retained much of his land claim in La Crosse and dealt in La Crosse real estate for many years. See more images, essays, newspapers and records about Nathan Myrick. A. H. Sanford, et al., Hist. of La Crosse (La Crosse, 1951); La Crosse Morning Chronicle, June 4, 1903; WPA MS.